Most perfumistas have a note, or maybe two or three or ten, that they simply can't bring themselves to appreciate. I have a few. I don't love mimosa or heliotrope, although I don't really hate them either. I can live without angelica, and anything more than a pinch of cumin is too much. I'm not fond of melon-y aquatics or very clean musks. My one true bête noire, though, has always been patchouli. Six years ago, a perfume with enough patchouli that even an amateur such as I could smell it was pretty much out of the question — which basically ruled out the entire oriental fragrance family. In the years since, I've mostly come to terms with patchouli, that is, I would no longer say that I hate it, and oriental perfumes are no longer verboten. I still wouldn't say I loved patchouli though, and a fragrance that actually has the word patchouli in the name isn't one I'm going to be rushing out to try. The Osmoz booklet from the Les coulisses du parfum, Vol III, Legendary woods & resins kit describes patchouli as "woody • camphory • green • earthy • mossy • mildewy". All of that sounds good to me, even the mildewy part — I think of oakmoss as mildewy, and it's one of my favorite smells in the world. But there's something about the particular way that patchouli is mildewy, in combination with the richness and the sweetness, that just doesn't work for me. You'd think that newer, cleaner (molecularly modified) versions of patchouli would work better for me, but they don't always — they usually wipe out much of the earthy part, which to me is like throwing the baby out with the bathwater. I do like Tom Ford White Patchouli, but it could use a few generous handfuls of dirt. So it's a surprise when I fall for a patchouli fragrance, but it has been known to happen. I loved Montale's Patchouli Leaves. And you know how once in a great while you smell something and you like it but you don't think you really need it, and then months later you're still thinking about it? That happened to me with the now-long-gone Angel La Part des Anges from Thierry Mugler, which was a sort of nearly-drinkable version of Angel that had been aged in cherry wood barrels in collaboration with Rémy Martin. If you could make a cognac out of patchouli, that would be it. "Regular" Angel is not a favorite of mine, but I do wish I had a bottle of the La Part des Anges. Elixir Patchouli, today's subject, is from Reminiscence, the French jewelry line. Their original Patchouli fragrance was introduced in 1970, and I presume it's done well since it's still around after all these years. For my part, I don't care for it, nor do I care for the newer Eau de Patchouli — which probably means that they're both excellent patchouli fragrances and that true patch fans would adore them. Elixir Patchouli is my kind of patchouli. It was launched in 2007, and is meant as a more intense version of the original 1970 Patchouli. I wish I had samples of the Montale and/or the Mugler to compare, because Elixir Patchouli reminds me of both scents. Like the Montale, it's very woody-barky, and despite being obviously vanillic, feels more dry than sweet (the notes: cedar, patchouli, vetiver, sandalwood, labdanum, vanilla, tonka bean, tolu, white musk). Like the Mugler, it has a "drink me" quality— not in the edible-candyfloss manner of the original Angel, but in the sense that it vaguely reminds me of a dry cognac, especially in the early stages, although if memory serves the La Part des Anges was more fruity-sweet than dry. Elixir Patchouli is a rich scent, but it's not at all too heavy for spring (I have a feeling it might be a bit much in high summer). It smells like chunks of wood bark mixed with warm, freshly-dug dirt. It's resinous, slightly spicy, and probably more masculine than feminine, although I should think anyone could wear it. It has excellent lasting power, and for a niche fragrance in 2009, it isn't too badly priced. 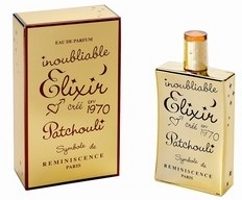 Reminiscence Elixir Patchouli is $120 for 100 ml Eau de Parfum. It also comes in a body cream, and do please comment if you've tried that! For buying information, see the listing for Reminiscence under Perfume Houses. It’s funny, I was just thinking about this yesterday: with the wealth of variable naturals and synthetics out there, it’s very hard to come up with a note I “don’t like”. As soon as you develop a rule, you think of an exception. I would have said I didn’t like leathers, but then there’s Chanel Cuir de Russie, S-ex, Lonestar Memories, etc. etc…. Then vetiver, which I’ve never gotten all the hoopla about. Vetiver scents always smell the same to me. But then there’s Sycomore, Etro Vetiver, the original Guerlain…. The only prejudice I haven’t been able to shake is white florals, and specifically orange blossom. I’ve even made my peace with LOTV, and tuberose and jasmine show up in some of my faves, but other than the original 2005 harvest L’Artisan, I can’t do O.B. I can’t. It’s whiny and soapy and makes me feel I’m attracting bees (I’m allergic). I would also like to love gardenia, but it mostly smells like cheese to me – no bad thing, but hard to deal with often. Cracking up at the idea of ob (which i adore) as “whiny” — that’s very funny for some reason! I have troubles with white flowers too, but normally really like orange blossom. Tuberose and lily of the valley are tough for me – thank god I like jasmine though! I went through a patchouli passion over the winter that was like my musk obsession of last summer: suddenly I had to smell everything patch. It’s ebbed some, but I now love several, including Patchouli Leaves & Prada Intense. This one sounds like something I’d like. Have you sampled Les Nereides Patchouli Antique, R? It’s very rich. I’d be interested in whether or not it’s *your* kind of patch. Fantastic review Robin! I’m admittedly a patch fan…the more the better…bring it on! This one is up there with the best of the best, and can’t wait to own a bottle come the Fall. I love Patchouli, I try to watch my application though! I haven’t tried the original, but these will go on my list to try for sure. I wear orientals (Magie Noir) and gourmands (Angel) so this will be a nice one to try. I love Montale’s Patch Leaves, that stuff lasts forever…. I have a feeling that if the body cream is well done, it would be awesome for layering w/ other orientals that you wanted to be more patch-y. Hope someone who has tried it will show up & comment! I appreciate your ability to invoke smell through words. Thank you. It seems to me like most patchouli notes are better left in supporting roles. When it predominates, it reminds me of when the sidekicks of bands or shows go off to front their own project. Don’t get me wrong, I like the Frasiers and Foo Fighters of the fragrance world, but it just seems to lack the cohesion of when those characters played the bass line. For me, I’ll usually end up going with Cheers and the Nirvana. Curious to try this though. Did that analogy make any sense? Also, robin, can you recommend a method of learning french for fragrance applications? I would be curious to know. Yes, the analogy makes sense — and the Frasier part gave me a good laugh. I don’t know that you’d find this so much of a straight-up patchouli in that way though, or at least, it isn’t to me. What do you mean by “french for fragrance applications” — do you mean how to learn the French terminology used to describe perfume? I want to learn french because of the massive amount of information about fragrances that is only available in that language. I am trying to pick a way. Normal classes? Independent learning? Are there any methods out there that you know of that you could recommend? Oh, I see — well, I don’t speak French so I’ll be no help at all. Whatever French I know I picked up from years of using Babelfish to translate for NST…I now know the names of most basic notes & whatnot (in French and a fair number in German as well), and verbs that are close to the Spanish I can make out, but no, I couldn’t read a newspaper — or even a kid’s book — in French. A lot of people like Rosetta Stone. I admit I don’t wear patch often, but I enjoy the scent, especially when it’s very earthy. Perhaps it’s due to my mom’s longstanding love of the stuff (though she was never exactly a hippie). I can only really wear patch in fall and winter, and the one I wear most often is Voleur de Roses. The Montale is very nice, and after buying my mom a bottle of Ava Luxe Sweet Patchouli, I wouldn’t mind a bottle myself (nicely warm and vanillic). Also received a sample of Patchouly Indonesiano (Farmacia SS Annunziata) recently that smelled really good. And my big confession is that I’ve fallen hard for the wonderful dark, dark patch drydown of Serge Noire, even though the top notes practically make me shriek in horror. Ah, see, Voleur de Roses — I recognize the brilliance, but cannot love it. I tried it again recently to see if it had grown on me, but no. It sticks in the back of my throat. Yet it isn’t at all too sweet, so I haven’t yet pinned down an accurate description of my bugaboo with patchouli. LOL. Well I’m not buying a bottle or anything (or of any patch, probably, except maybe the cute 30ml Ava Luxe), but yeah, I’d wear it on a cold, blustery, rainy day to keep me warm. Trust me to get some wear out of any of those reject samples that singe your nose hairs, okay? And how are YOU liking the Sécrétions Magnifiques? HA! If you love that, I’ll truly eat my shorts. I know you’re lying through your teeth, fortunately. I think it scrubs off quite well, which is good, because after you place one tiny drop on the back of your hand, you’ll be at the kitchen sink within minutes, Brillo doing a number on your epidermis. But yes, let me know how the rest of the package works for you! My curiosity is killing me though…. but I wouldn’t want to go out somewhere …I can see the headlines now: STINKY WOMAN WITH HAIRLESS NOSTRILS FOUND UNCONSCIOUS…. I suppose we should stop using this thread as our personal chatroom. Sorry everyone. Just wanted to say that it will not burn your nose hairs, it will just make you — as mals so delicately puts it — “want to hurl.” And I mean it. It’s like a very sick perfumery joke. Love the review, especially since I’m right there with you about patchouli. Maybe in another 50 years, patchouli will be just another note and not a cliche to us oldsters. So true — hadn’t thought of that! Please God, let it be gone soon – along with fruity florals. This is a great example of never say never, huh? Thing is, in some ways it’s SO much easier to stick with not liking something cause it means eliminating a whole genre of fragrances – sometimes I get so overwhelmed with the hundreds and hundreds of fragrances out there that being able to eliminate something is somewhat of a relief! Means I don’t have to bother with anything that has that note cause I KNOW I don’t like it!!!! But, oh, that’s so not true…there are so many variations in formulas that when a certain something we don’t like is paired with something else in just the right manner – suddenly it’s LOVE! How can that be? It seems there are always exceptions to the rule. But do we bother to smell those hundreds of aquatics or melons or patchoulis or (in my case) ambers til we find that ONE that we’ll love? Oh no. Wast of time. I think it has to come from sheer luck. Cause there are way too many other fragrances out there to bother with focusing on the ones with notes we don’t like, right??? Anyway, I’m so very happy you’ve found patchoulis that you like! I actually have a sample of Reminiscence Patchouli (not Elixir…at least I don’t see it on the vial label) that I received with my last Beautyhabit order. Haven’t tried it yet…but I’ll have to try it. It is so true…esp. now that we’re getting 1000+ new scents a year, it just isn’t worth it. It isn’t always worth it to smell things that *do* sound appealing if I don’t already know the brand. Patchophobe coming out of the woodwork here! (um, not that I’ve kept silent on the subject of patchouli not being my friend). Six months ago I was avoiding testing anything with that note, and now I find that some of my very favorites contain it. I’m not sure why I hate it, since I don’t really have any headshop or hippie references – I just, simply, dislike the smell when it’s more than a hint. Voleur de Roses made me want to hurl (I apologize to those of you that love it), and Shaal Nur and Gres Cabaret were lovely woody rose fragrances with, to my nose, too much patchouli. C, I will not sit by you when I’m wearing VdR, ok? Betcha the “Roses” in the name fooled the heck out of you, didn’t it? Bwaahahaha. Seriously, though, I’m still looking for the rose in that one, but I do love the boozy, plummy patchouli on a cold, wet winter day. Here, have some Pepto. Joe, you are such a humanitarian, sharing the pepto and all. Boozy Plummy Patchouli? No wonder I loved it so, I’m a bourbon drinker…. HA!! Wrong! I didn’t order it at all; It was a free sample sent to me by Aedes after they screwed up a sample order (they left out one sample, and when I emailed them, they sent that one with five extra for company. Kudos to Aedes for terrific customer service!). Even Shaal Nur?!? I don’t think I even noticed there was patch in SN. My test notes on that one say, “Nice spices in here, lovely rose, delicious woods and incense. Unfortunately, I had to pick up this honkin’ big patchouli rug to find them.” I think that my skin must magnify the patch. Or maybe my nose does, because I didn’t even get past sniffing the vial of Voleur de Roses before reaching for the barf bag. R, I love the rootiness of iris. I love the mustiness of oakmoss, adore the spiciness of cardamom and the senuous, almost spiritual, air of incense. But the wet earthiness of patchouli is a bit too much for my nose, especially in large doses. I have come to like it a smidge more over the years, but it’s not love, at least not yet. However, I must admit that I do indeed love a good “cleaned up” patch, like the patchouli notes found in 31 Rue Cambon, Enlevement au Serail and Coco Mlle. I guess I am hopeless! Oh, and by the way, when I speak of the rootiness of iris, I need to tell you that I love Eau de Gentiane Blanche! PR is not for me, but the minute GB goes on discount, I know I will purchase a bottle of it. So glad you remembered to report back on GB, that is good to know. Maybe one of these days it will grow on me, eh? Meanwhile, I’ll have a bottle of PR & you’ll have a bottle of GB. This is bad, soooo bad…..here you are waving the promise of the perfect patch for patch-pansies in front of me WHILE I’m sitting here with Amouage Ubar on one arm and AT Une rose chypree on the other! so I’m sniffing and thinking ohh, gotta have some this and reading and thinking ohh, gotta have some of that…..this is bad, so bad. That AT is really something special, isn’t it? But the Ubar… is it really working “gotta have” magic on you? And I thought you might be totally immune to any words extolling the patch? Oh, the Ubar is calling my name alright! But it’s going to have to wait …at least that’s what I’m saying today…I do have an anniversary coming up….ack! Ubar is pretty alright – a little too tightly wound in the opening for me but I like the drydown. I was sad that Rose Chypree has a weird fried food accord for me. But relieved as well – I’d take Lyric over it any day…. Fried food? lol. Must have been something you et. Ah Tama – the rose and spices are so lovely…but its like I’m sitting in this Cuban restaurant I like and there is a plate of fried plantains under my nose. I know it is very strange – and I tested it more than once!! I have no idea what it is! Ann, I am going to be on the lookout for the platanos fritos accord next time I sample it… sounds kind of delicious. Speaking as a patchouli nut – this sounds divine. and speaking as a card carrying patch-pansy this sounds divine! haha Yes, there’s a lot to love in those notes. Great review, thanks! I’ve been on a patchouli kick for awhile, which I never thought would happen. I can’t wait to smell Elixir Patchouli. Plus, I forgot to mention, that bottle is kind of adorable. It really is darned cute. I used to be like most people and disliked very much patchouli b/c it reminds me of hippies & head shops, etc. So you can only imagine my suprise at realizing my beloved Bal a Versailles is a hippie in a ball gown. Really, I used to not pay any attention to notes and things. So that was that. Sometimes patchouli works for me, and sometimes it doesn’t. I don’t really care for the cleaned up patchouli, but I think that is mostly b/c the fragrances it’s in are too boring anyway, though I did think that White Patchouli was OK….My most recent patchouli love (and this one indeed makes me smell like a very elegant hippie) is Andy Tauer’s Maroc. But for some reason I can never end up liking Voleur de Roses which smells a little rotten on me. I think my other great patchouli love is the Sonoma Scent Studio Tabac Aurea which is just gorgeous – pipe tobacco and woods – how can you go wrong? Never say never…..
Ann, you get patch in BaV? I love BaV’s dirty side, although it took me a little time to get past the heavy classic florals that made it seem “too perfumey” for my novice nose. But it doesn’t seem strongly patchy to me. Scents that DO seem patch-heavy to me but that I love anyway: Organza Indecence, Tocade, and Hanae Mori. All strongly vanilla. I never realized there was patchouli in BaV until I’d been wearing another fragrance –?? it was either Magie Noir or Prada?? – but when I went back one day to wear BaV all of a sudden all I could smell from BaV was this major old fashioned patchouli smell. Normally I don’t think it is patch heavy at all, but something just sensitized my nose to the patch that’s in it that I’d never really noticed. It really surprised me b/c normally I just smell those dense rich florals and the civety-animalic-amber dry down. I need to re-test Org Indecence again – it reminded me of something else….musky, but I didn’t notice the patch in that either. I suppose that’s a good thing if it sneaks in there! LOL at “rotten” as a description of poor VdR. Yeah, that’s about how it smells to me too. I *really* wanted to like VdR too b/c it was the first L’Artisan that I ever tested, and occasionally I revisit it, but it is always the same. I get a similar accord from the Miller Harris Rose en Noir — too bad for me. I’m stil looking for the perfect dark rose for me! Ah well, more VdR for me! LOL. Ann, have you tried Czech & Speake? How about Red Aoud? Hey Joe – thanks for the tip — I’ve not tried those, so I’ll put them on my list! I did get a nice swap sample of Comme des Garcons 2 that I liked and need to test again. I guess I should stop complaining about my patchouli aversion, since I CAN wear a lot of notes that some people find troublesome. Rose, white florals, aldehydes, iris, vanilla, mimosa… I do well with all of those. And if the base of some fragrance contains patchouli + vanilla, benzoin, and woods or amber, I’m probably going to be fine. Six months ago I was avoiding everything, absolutely everything with patchouli in it, and since I relaxed that “rule,” I find that my absolute favorites generally contain a little bit of it. Light bulb theory: maybe my problem with chypres is actually a problem with patchouli! And even with my chypre-aversion, there are a good six or eight floral chypres that I like very much. It could be — patchouli is a common ingredient in both modern & classic chypres. It’s also amazing though how tastes in perfume can expand. Seriously, in 2002 I like citrus, light citrusy chypres & light florals, that’s about it. You are right – sometimes it is about retraining the nose/brain as you learn more about accords. I’ve done well adjusting my nose and tastes to chypres (LOVE oakmoss – so so on Patch), galbanum, aldehydes, and the big ones – tuberose and lotv….it is still an work in progress, which is why it is so fun to keep discovering new or rediscovering old! The only notes I persist in having real troubles with are incense and cumin (sorry Jubilation 25). I think Lyric is about as much incense as I can take! Major patch fan here, from the time I was 17 or so. I don’t love all patch frags, though. The Histoire des Parfums Noir patchouli is not up my alley, but the 1740 Marquis de Sade is love in a bottle – dirty love, to be sure, but, yeah. Also Il Profumo makes a lovely Patchouli Noir that is only tough when you wear too much. I like it sweet, I like it dry, I like it dirty. Just gimme. Actually I don’t really care for the cleaned-up variety – if just becomes a note to blend in with everything else. I thought that HdP was really well done, but it isn’t really up my alley either. I have trouble with patchouli, too, but I’ve been curious lately about Parfumerie Generale’s Intrigant Patchouli, mainly because of the alleged skanky musk that is paired with the patchouli. Has anyone tested that one, perchance?? I have tried it – my initial notes say “smells different every minute, bad, good, bad, good, fairly sweet, smells a little cheap, okay on the drydown” for my first try, but when I teied it again I liked it better. Did I take notes? Of course not. But it is not in my rejects and if you are exploring patch I would give it a sniff – it is quite complex. I tried it, and sorry to say that about all I remember is that I didn’t think it was all that heavy on the patch. Sorry, not much help! As a lover of both patchouli and skanky animalic scents, I have tried Intrigant Patchouli and I love it. It doesn’t have a high skank factor for me (I’m wearing L’Air de Rien right now! ), but I get the patchouli mixed with a nag champa incense note, and for that reason I love it. It’s like nothing I’ve smelled before from a patchouli fragrance, and I appreciate that novelty. Also, I am too young to associate patchouli with hippies and head shops (whatever those are), but this one totally reminds me of this import store in Australia where they had Indian blankets and stuff from Tibet (including nag champa). something in Coco Mademoiselle makes my eyes itch. Being trapped in a car with Black Orchid for an hour was horrible. Voleur de Roses kind of has the same effect too. I want to blame the patchouli, but I do like some patchouli scents. Like I love Santa Maria Novelle’s. I have not tried the SMN! Yes — Black Orchid would be challenging in a closed space!! It is very intense! First, I’m curious about these Reminiscence patchoulis, since patchouli is about my favorite thing ever (I’ve worn the oil for years before my perfume-maina took over). Interesting that Elixir is menat to be more intense…I’ll have to try all three and see what my patchouli-loving soul thinks. If you did not like the Montale, don’t know if you’ll like this one either…do come back & comment if you try it! I always liked the smell of patchouli oil and when I began buying my samples last year, I got four patchoulies thinking that I’d love all of them (Il Profumo Patchouli Noir, Mazzolani’s Patchouli, M Micallef’s Patchouli and Montale’s Patchouli Leaves) and the only one I really did was Patchouli Leaves, so much so I bought a bottle. The others (except for Micallef’s which gave me a headache) were beautiful but conventional and even a little conservative. I moved on to other domains of notes but your review Robin made want to go for a second Patchouli round. Thank you! I traded away a Patchouli Leaves decant because although I appreciated its aroma, I found it a little much straight up like that–maybe too dry like Borneo on me. The patchouli heavy frags I wear the most are Black Aoud and Coromandel. See, Coromandel literally makes me nuts…I had to scrub it off. Same with Borneo. I am really not a patch fan! 2scents, we have a different taste on patchouli perfumes then. I tried Coromandel in a Chanel boutique last year and would have bought a bottle had they had anything smaller than the 200ml!!! (yes, I guess they want you to wear it for life!). The first splash was absolutely fabulous. But good thing I didn’t buy because after 3 hours or so, it had transformed itself into a chocolate musk syrup that I didn’t like at all. There was not patchouli left. I was surprised to like patch in Givenchy’s Ysatis. It’s not a fragrance I’d wear but I do appreciate it on others. A friend of mine sprays it daily under her arms instead of deodorant! i tried the original Patchouli by Reminiscence, i loved it, reminded me of Obsession by Calvin Klein but a much more elegent fragrance. never been a patchouli lover but it seems i’m turning into one! LOL…always beware trying notes you used to hate — eventually, you like everything! I have found love in a little sample of this Elixir. I read your review while doing some Patchouli research and decided to try it. Perfume Court is Fabulous and sent me my tiny bottle of heaven. I love this stuff!! Glad it found another fan!